The delightfully absurdist tale of how old Pettson overcomes obstacles big and small to bake a birthday treat for his cat. Crotchety but good-hearted old Pettson lives alone with his cat Findus, who wears clothes and talks (at least to Pettson). On one of Findus' birthdays - he celebrates three a year - they are out of flour. 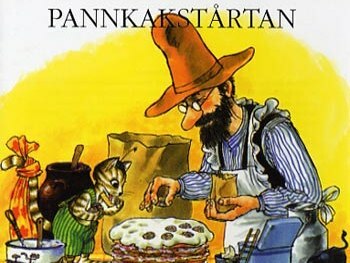 Pettson comes up with a plan that involves tying flowered curtains to Findus' tail, aggravating the bull next door, and retrieving a key from the bottom of the well, so that Findus can have his customary stacked pancake birthday cake. They pull off their caper successfully, but the incident also convinces Pettson's neighbors that he is going senile - not like he cares, since he and Findus still have a splendid time. The Pettson and Findus series (well, the early books - I see some more have been written since the 80s) was a firm fixture of my childhood: my best friend growing up had a tabby called Findus after the series duotagonist, and my mother and grandmother made me the pancake cake for special occasions (though we used waffles instead of pancakes to make it more stable). The storyline here is amusing, but the pictures really take the cake. 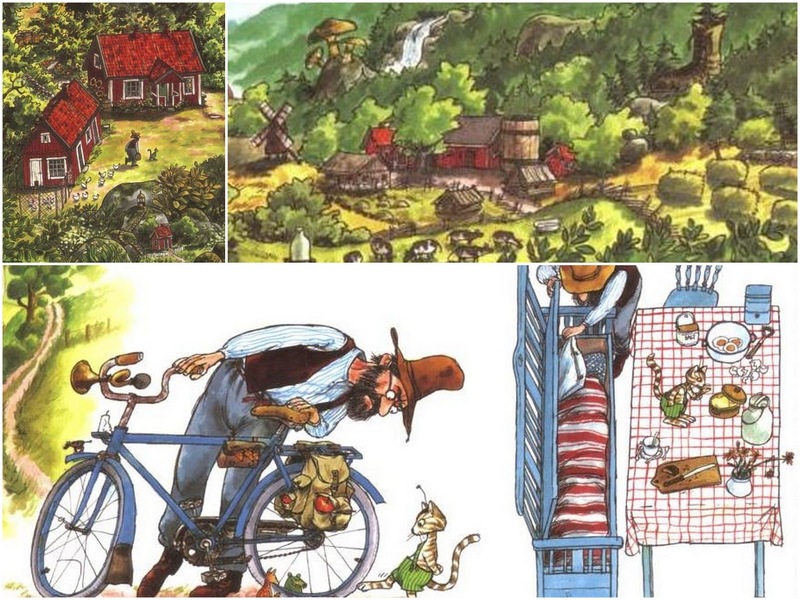 Pettson and Findus' world is lovingly detailed, with countless surprises like little trolls ("Mucklas" according to the German website) with teeth sharp enough to gnaw through bicycle tires; a miniature schnauzer reading his paper on an armchair; a wrench with eyes; or a a giant can of pineapples used as a water barrel. Lee and I spend hours poring over the book, which provides new fodder for discussion with each reading. And from an adult perspective, I appreciate the ambiguity: do the little trolls really exist, or are the unexplained incidents in their house the result of Pettson misplacing items? Can Findus really talk or is Pettson just lonely? At any rate, it's completely engrossing and a sure way to procrastinate turning off the lights.